As big as previous real estate and stock market bubbles have been, the current global bubble in government debt dwarfs them all. Not only is it far bigger in size and scope (some $60 trillion in sovereign bonds now trade globally); it is also unprecedented in character. The world has rarely seen a bond bull market that is not only 36 years old, but also shows few signs of ending. And never before in recorded history have interest rates gotten so low across the board. How much lower can interest rates go? Conventional wisdom once held that rates could only get as low as 0%. WRONG! In the current crazed central banking climate, yields on cash can move below zero, and they could stay there for longer than anyone can possibly imagine. Negative rates – where lenders pay interest to borrowers – are a strange-but-true phenomenon in Japan and throughout much of Europe. They aren’t confined just to overnight rates set directly by central banks. They have spread across the yield curve to afflict the long-term bond market as well. The U.S. Federal Reserve is now contemplating a negative interest rate policy even as it jawbones about raising rates. At its August Jackson Hole gathering, Fed officials listened to economist Marvin Goodfriend make the case for negative rates (and another draconian measure, as I’ll explain in a moment). "It is only a matter of time before another cyclical downturn calls for aggressive negative nominal interest rate policy,” he said. 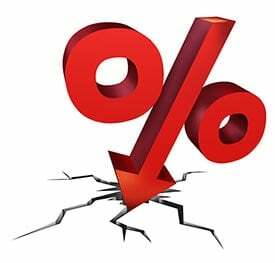 The U.S. economy is overdue for a recession, and when the one hits, Goodfriend suggests the Federal funds rate will be dropped to as low as -2%. 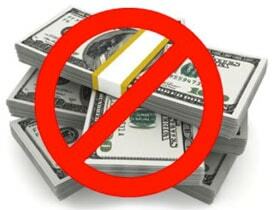 Goodfriend is no friend to holders of cash. Not only does he want to penalize savers; he also proposes eliminating coins and paper notes from circulation. After all, if your bank account “pays” negative interest, holding physical cash under your mattress would give you a higher yield. So central bankers would rather see cash be eliminated to prevent you from pulling it out of the bank. Fed Vice Chairman Stanley Fischer said in a recent Bloomberg interview that negative interest rates “seem to work.” While he denied that the Fed has any immediate plans to pursue a negative rate policy, he sure sounded favorable to the concept. There is an escape hatch for those who fear being trapped in a negative yield regime. Hard assets, including physical precious metals, have no interest rate attached to them. Putting aside capital appreciation qualities, a gold coin with a 0% yield also offers a superior yield to any currency instrument with a negative rate affixed to it. Gold and silver are normally seen as more attractive forms of cash when cash instruments yield less than the inflation rate (i.e., negative real interest rates). But in a negative yield environment, precious metals also have the advantage of sporting nominally higher yields. Many economists, who assume that markets are efficient and that investors make rational choices, remain puzzled as to why negative yielding bonds have attracted nearly $16 trillion in inflows globally. The standard models for evaluating bonds assume that a bond must offer at least some nominal yield above cash to make it more attractive than simply holding cash itself. Logically, there shouldn’t be any demand for negative yielding bonds under any circumstance. Why would investors in a free market wittingly pursue sure-fire losses? And yet, today, there is enormous demand for bonds that promise to pay back holders less than the principal they invest. It’s important to recognize that negative yields are being imposed on markets by central banks. Many institutional investors such as commercial banks, pension funds, and insurance companies are effectively forced to own government bonds regardless of what they yield. Then, speculators come in who don’t care about logic or sound fundamentals, but only care about chasing extant trends. Continuation of this trend seems likely when we have central banks willing and able to create unlimited amounts of currency to buy bonds. This trend begets followers, and followers exacerbate the trend – often to the point of “irrational exuberance,” as Alan Greenspan once put it. Bond market speculators can potentially reap capital gains even on bonds that carry negative yields. If future bonds get issued with rates that are even more deeply negative, then the values of all previously issued bonds will keep climbing. 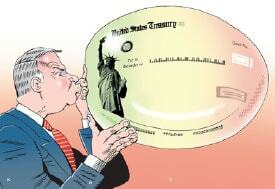 Given that rates in the U.S. are still positive, the bond bubble could get much bigger before it bursts. U.S. Treasuries with yields of 1%-2% may be historically low, but they look fat and juicy to Japanese and European investors who get literally less than nothing on bonds in their home markets. In other words, the government bond market still looks like a raging bull. Before you go chasing after capital gains in Treasuries, however, consider the risks of owning bonds at today’s ultra-low yields. You could subject yourself to massive real losses over time if inflation rates perk up. Even nominal capital gains in bonds could prove to be illusory in real terms. Gold and silver are premier assets to hold if you are concerned about negative real interest rates. Precious metals markets offer no guarantee of inflation-beating returns in any given year, of course. But if you’re thinking 30 years out, would you rather put your trust in metals – or in a bond issued by an over-indebted government that promises to pay you a historically low yield? Although low to negative interest rates could persist for years, odds are the current low-yield craze won’t last a full 30 years. Therefore, at some point down the road, today’s buyers of 30-year bonds will likely wish they had parked some of their savings in physical precious metals instead.